Well, we had a successful time at home with Fletcher. He did great and we really enjoyed being able to go to church together. Craig and I were exhausted after we took Bubba back to TCC. WOW! 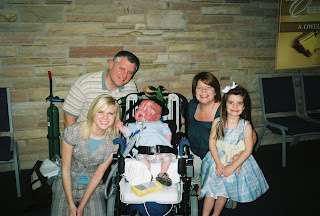 Our respect grows for the nurses and respiratory therapists who care for him! We realize why it takes 3 shifts of nurses and 2 shifts of RT's to care for him, lots of medicine and breathing treatments! It was a lot of hard work, but worth every minute! Maddie and Fletcher waved palms, well Maddie waved palms. I have always loved Palm Sunday there is just something about seeing children walking through the sanctuary praising the Lord! 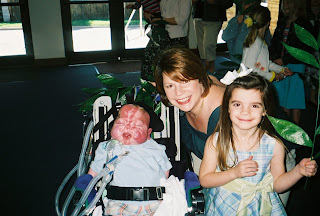 I was so blessed to push my sweet Fletcher in his wheelchair with his sister walking proudly beside him. We were so blessed to see you all together!!! Hopefully, Fletcher will get to see us more often!